This weekend, Tara McPherson will be setting up shop at Five Points Festival 2018 at the Brooklyn Expo Center, and she’s bringing with her some exciting exclusives! Just check out these beautiful custom Stella and Flux vinyl figures. Cast in green soft Japaense vinyl, these unpainted figures have had real Swarovski Crystals applied to them by hand by Tara! There are only three of these sparkly Stella and Flux figures available, one with red crystals, one with pink crystals and one with turquoise crystals. Each figure stands 9” tall and features 5 points of articulation. 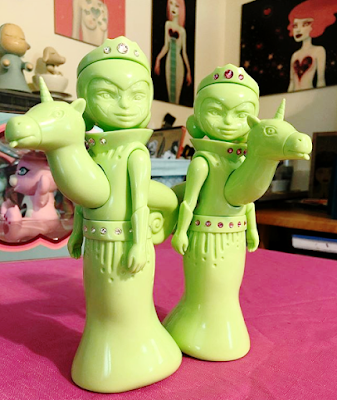 Collectors can purchase these one of a kind figures exclusively at Tara McPherson’s Five Points Festival booth #123 for $150 each.